We love learning about the results our customers get after integrating our productivity solutions. In this new Shop Floor Automations case study, our customers at Stollen Machine talk about how our hardware helped combat downtime. 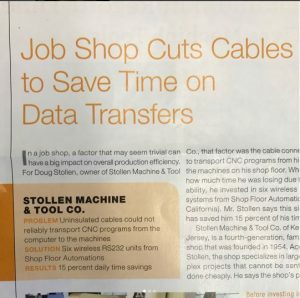 In this October 2017 case study published in Modern Machine Shop, Doug at Stollen Machine says his inferior cabling was causing communication issues with his machines. After researching and weighing the pros/cons, he decided to go with our Wireless Connect devices in his multi-generation shop. Investing in six hardware devices from Shop Floor Automations helped to replace an old system that wreaked havoc on Stollen Machine’s shop floor. The study found that they were able to get back 15% more time daily, which is invaluable in the manufacturing process. Hardware isn’t the only way we help customers, either. Another customer of ours, Tech Manufacturing, attributes using machine monitoring through Shop Floor Automations for helping with overall productivity just by monitoring utilization. With many other solutions on hand, we look forward in the future to sharing more of these case studies with the manufacturing industry. A little info about Shop Floor Automations: SFA was established in 1998 and will soon be celebrating our 20th anniversary in business. We support efforts to fill the skills gap, such as MFG Day and writing about organizations who focus on this cause. Our focus is to help the Made in America movement by supplying tools and support to combat downtime, increase OEE, organize your shop floor, and help with machine communication issues. Contact us today!